Cosel introduces its new PCA600F Digital Controlled Power Supply, a high efficiency, extremely small digital assisted 600W AC/DC power supply. 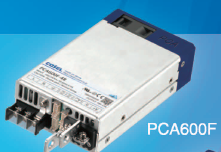 Unmatched in size and performance, the PCA600F Digital Controlled Power Supply is available now. The PCA has Medical and well as ITE Safety Certifications ANSI/AAMI ES60601-1, EN60601-1 3rd, and is only 89mm W X 41mm H X 152mm L – 3.5” X 1.61” X 5.98”. The Extended UART can monitor or control 21 different functions including, input & output voltage, current, set constant current, Remote ON/OFF, set output voltage and other functions.